Our challenge this time, chosen by ME, is a color challenge. The Colors are Black, Orange, Yellow, and Green. With an optional Halloween theme. Since only the USA and Canada celebrate Halloween, we did this color challenge so everyone could take part. And, some of the gals on the design team have come up with some really creative ways to use a regular House Mouse stamps for Halloween. We are joined this week by our two Guest Design Team Members, Jennifer and Avril. Take a look at the awesome inspiration our great team of designers has come up with then ink up those House Mouse, Gruffies or Happy Hopper Stamps and join us. This challenge runs through October 23rd. 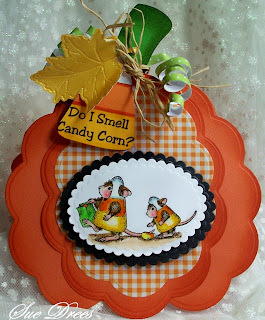 I'm entering my card in the Tuesday Throwdown Challenge, which this week's theme is Halloween. Sue, this is one of the cutest cards I've seen in a while. How creative. The sentiment along with that image made me laugh out loud. Terrific coloring. Everything about this card starting from the shape is wonderful. Thank you for sharing. Fabulous create Sue, I love the the shape - so perfect and your mousies are beautifully coloured and details are so beautiful. Awww Sue how cute are these guys?? gorgeous colours great creative HM creation love it..
Sue, this is positively adorable! Wonderful layout, your coloring is the best, and I just love this stamp. So sweet! A wonderful creation! Oh my gosh Sue!!! This creation is just too stinkin' cute for words girl!!! 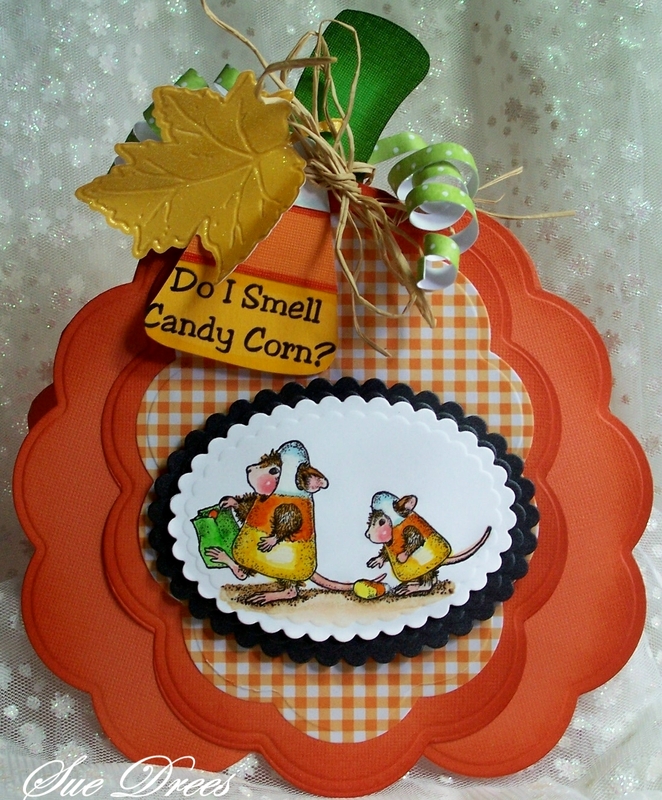 LOVE the candy corn shape and your darling mices!!! That tag is such a hoot too!! these are cute sue, what a fabulous card and a great shape. yes I'm glad i can use my husband pc we can't white out it. This card is sooo cute! 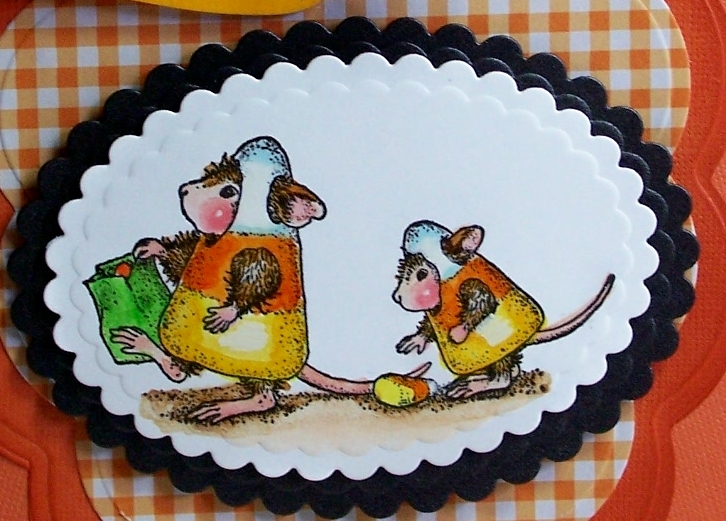 I love how you made a pumpkin for the card and these mice are adorable! great job! I love your pumpkin shaped card, Sue! Those mice look so cute on it! The candy corn looks real enough to eat! Wonderful creation and humorous too, perfect combination! hi sue fabulous card!!!!!! love that image and the papers you have used!!! Oh Sue this is really really cute. Donna is correct. Everything about the card says WOW! Great idea to chose colors instead of a holiday for the challenge. I wish House Mouse sold digis. They are so cute. I would love to play along. 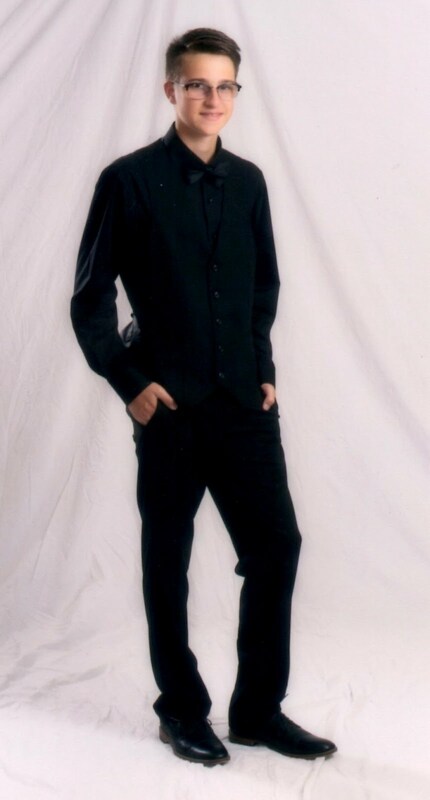 BASP... Holy cow girlie this is AWESOME! So very creative pumpkin and wonderful coloring. Oh me oh my mice!!! This is precious!! What a wonderful design and those mice, so dang cute Sue, love your details too!!! Micey nice work! !